Spain is blessed with a mild Mediterranean climate and a variety of terrain. With mountains in the north, southcentral, and west of the country, as well as rolling hills, forests, and farmland, Spain offers a long list of game animals, many of which are unique to the Iberian Peninsula. The quality of guiding, lodging, food, and other amenities is outstanding in Spain. Spain is also a leader in progressive wildlife management, and its wildlife populations are stable and produce excellent trophy quality. Spain is famous for its four varieties of ibex, each of which occupies four disparate geographical regions. The Spanish ibex (Capra pyrenaica) has four subspecies: Gredos, found in the Gredos Mountains near Madrid; Beceite, in the mountains of Valencia; and the Southeastern and Ronda ibex, both of which are found in the coastal mountains of Andalusia. Spain is also home to two subspecies of chamois: the Pyrenean chamois of the Pyrenean mountains, which separate Spain from France, and the Cantabrian chamois from the Cantabrian mountains of the north coast. Both chamois hunts and ibex hunts take place in scenic mountain country. Other game includes red stag, Iberian wolf, Barbary sheep, Iberian mouflon, Balearian boc, roebuck, fallow deer, and wild boar. In medieval times, a royal driven hunt in the Montero Hills gave rise to the famous driven hunt called the Monteria. 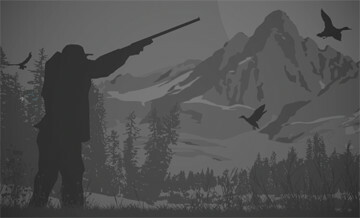 This traditional way of hunting big game entails hunters at stands approximately 300 yards apart. The hunting area is normally very thick and brush-covered, so hounds are used to drive game to where the hunters are located. Species hunted in a Monteria typically include red deer, roe deer, and wild boar. If bird shooting is your game, Spain is also famous for its red-legged partridge. The red-legged partridge is indigenous to Spain and considered one of the world's fastest and most challenging game birds, with a rapid and irregular flight pattern. Driven partridge shooting, known as Ojeo, is a style of hunting typical in Spain, where the hunter waits at his station for the partridge to fly over. During a day´s shooting a line of six or eight shooters may bag as many as 1,000 partridge. Holders of passports from the USA, EU countries, and many other countries do not require a visa for a tourist visit to Spain. Bringing your hunting rifle to Spain requires filling out a form available from the Spanish Consulate. Information required includes your personal data, the firearm information, dates of your hunt, as well as locations (the outfitter should help you with this). You will have to provide a notarized copy of your passport, as well as a notarized copy of an American hunting license. Provide this form to the Spanish Consulate no earlier than two months prior the hunt, and you will be provided with a certificate allowing you to bring your firearm to Spain. Send a copy of the certificate to your outfitter and bring the original with you. Once you land in Spain, your firearm will be taken directly to the police office at the airport. Collect your luggage and go through Customs, and your outfitter should meet you and take you to the police office. There you present the Consulate certificate and will be given a temporary permit, which has to stay with the gun until you leave the country. 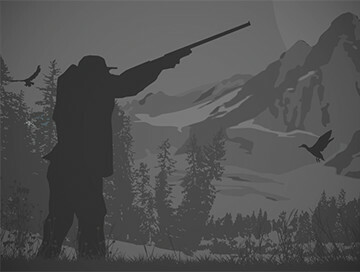 Mountain hunting anywhere can be challenging, so a reasonable level of fitness is important. In general, chamois hunts are more difficult than ibex hunts. Waterproof boots with good ankle support are a must, and gaiters are a good idea. Camo is acceptable. When leaving Spain, you will be required to pack your ammunition separately, so be sure to bring a sturdy metal or plastic box that can accommodate your remaining rounds. At the airport, you are again required to stop at the police office to declare you will be traveling with a firearm. The police will provide you with a form with your flight and firearm info; one copy will stay in the case, and the other is for you to show at the airline counter. Then you will be able to check in. Trophies are generally transferred to a local taxidermist who will clean and treat the skulls and hides. When this process is completed (around three months after the hunt), the taxidermist or outfitter should deliver it to a customs broker with all the paperwork and an invoice for shipment will be sent to you. Allow four to five months to receive your trophies. Classical stalking hunt for one of the Spanish Ibex Slam specie - Beceite Ibex! Package includes 5 Ibex Females trophies! Bow hunting and falconry are available. Woman, the tours have a discount of the 10%. Family, the discount of the tour is 10%. More than 1 person (Friends), the discount of the tour is 5%.